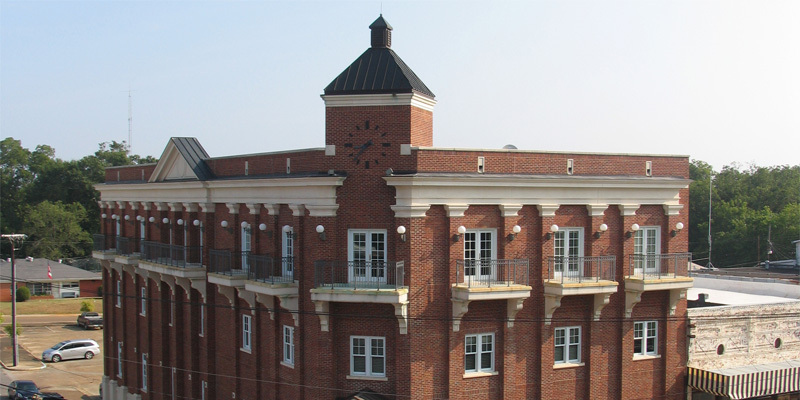 Ivey Mechanical Company, LLC was founded in 1947 by Mr. Kermit Ivey in Kosciusko, Mississippi as a small repair shop focused on residential and small commercial construction. Over the next 10 years the company steadily grew and by the 1960's Ivey Mechanical had become a major player in mechanical construction throughout the state of Mississippi. In the 1970's the company was landing large industrial contracts. Today, after 70 years of service, the company operates under the leadership of Larry Terrell and Denny Terrell under the name of Ivey Mechanical Company, LLC. Ivey Mechanical currently employs over 1,000 people with annual revenues around $200 million. "We had been using an older pipe cutting machine," said Todd Burrell, Fabrication Manager. "We had consistent mechanical and computer problems with this older machine and we could never get any real support." "We wanted to cut all our threadolet holes and fabricated tees from downloaded CAD drawings. As the number and complexity of our projects continued to increase, we needed a machine that could provide more capabilities and support at our fingertips. Support is not something we need all the time, but when we do need support it is critical to get it quickly. 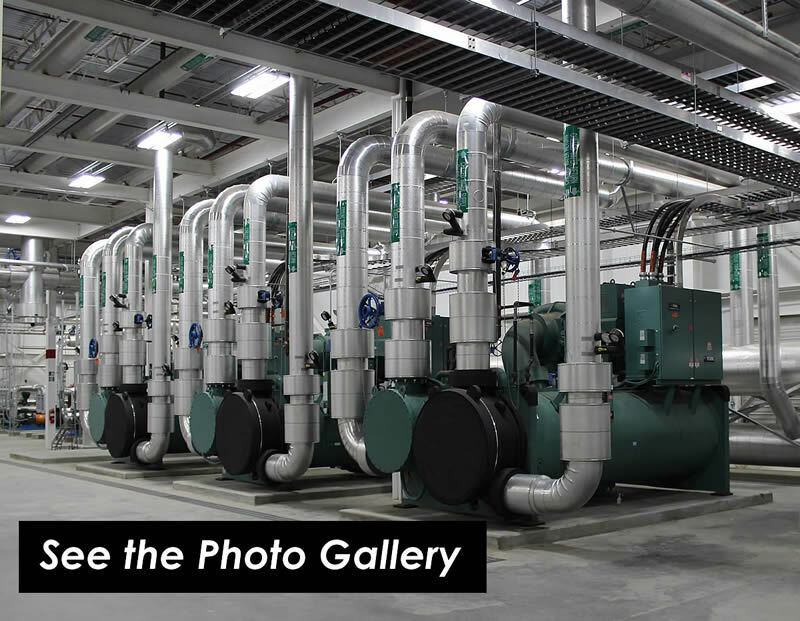 "We visited a couple large fabrication shops to see what they were using. There were several things we observed that helped us know what we wanted to avoid and to isolate what we really needed. A few members of our team attended FabTech in Atlanta, went by the Watts-Mueller booth to see one of their machines and were sold. 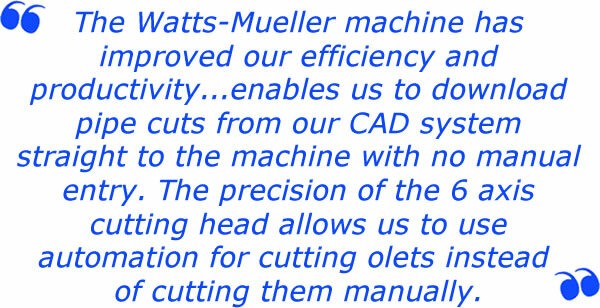 They returned convinced that a Watts-Mueller 6-axis machine was what we needed." Todd has been with Ivey Mechanical for almost 11 years. His day-to-day responsibilities include the management of both the Pipe and Heavy Metal Fabrication Shops. Todd manages the pipe welders, structural welders, sheetmetal welders and sheetmetal fabricators. 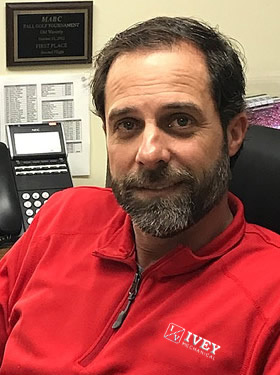 Todd also ensures all the work is accomplished in an efficient and safe manner in order to meet delivery schedules, quality standards, budgets and codes. He is also the Quality Control Manager for the ASME Code Department. 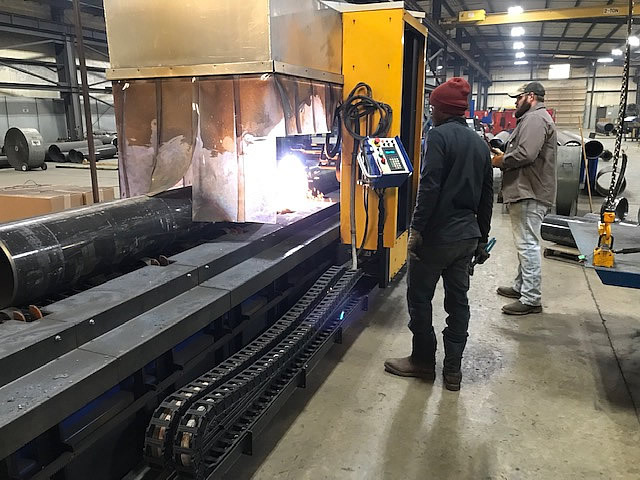 Ivey Mechanical selected the Watts-Mueller W-244 pipe cutting machine with a 20ft conveyor bed on the front and the back of the machine. 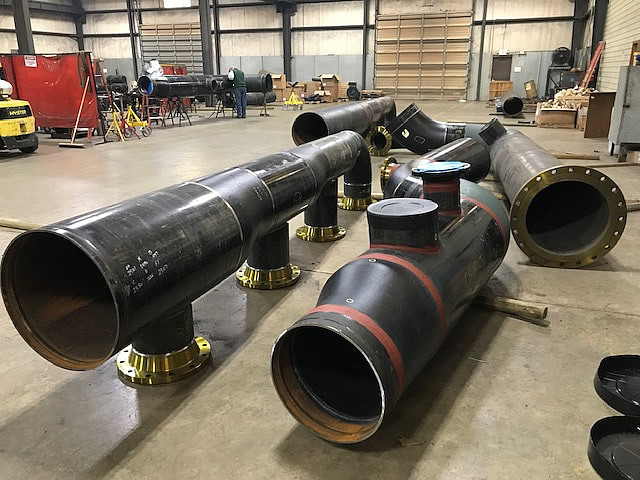 "The Watts-Mueller machine has improved our efficiency and productivity within the Ivey Mechanical pipe shop," said Burrell. "This machine enables us to download pipe cuts from our CAD system straight to the machine with no manual entry. The precision of the 6 axis cutting head allows us to use automation for cutting olets instead of cutting them manually." "The 3D pipe cutting software gives us efficiency cutting to length. The cuts are always precise and the bevels are excellent, so there is very little weld prepping. The ability to nest cuts also makes our pipe fabrications more efficient. We set up conveyors on our machine so there is very little manual labor involved getting pipe onto and off the machine." "We needed more automation to enhance our safety," said Burrell. "Prior to getting the Watts-Mueller machine we used cranes to pick up the pipe and move it to our machine. This presented the possibility of injury and material damage. When we purchased the W-244 we also invested in the machine bed and conveyors with rollers. This enhances our safety and cuts down on the labor of moving pipe around. It is now a one or two man operation." 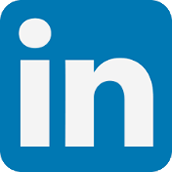 "The nesting function in the 3D software pushed our efficiency forward," continued Burrell. "We cut 21 ft pipe. I might load 200-300 pieces of pipe into the system - when the first pipe is completely cut we just load the next one and the machine starts back where it left off. I input straight cuts, bevels and holes and the machine gets it done. "I really like the elegant feature Watts-Mueller software gives me for the 'last cut in the chuck'. 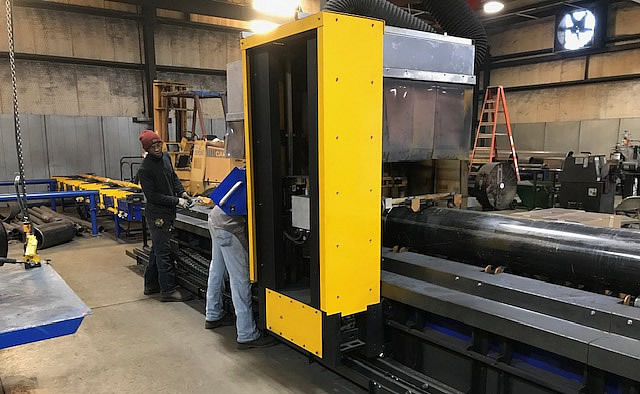 The machine software can automatically execute the nesting cuts so that the scrap or drop piece of pipe is the first cut and the final cut that is left in the chuck is a finished production part. This has given us much lower material waste." "Every now and then we fail to get the cutting precision we need. I just pick up the phone and I can get a Watts-Mueller Rep on the phone. They always quickly get us back on track."